Statement on Islam and nationalism in reply to a statement of Maulana Hussain Ahmad, published in "Ehsan" on the 9th March, 1938. This article has been slightly edited by Koranselskab. Small typing and spelling errors have been corrected. I have used the world "millat" in the sense of "qaum" (nation). No doubt, the word millat has been used to mean law and religion in Arabic, and especially in the Holy Quran, but there exists in modern Arabic, Iranian and Turkish languages considerable evidence to show that the word millat is also used in the sense of nation. In my writings I have generally used the word in the latter sense. But in view of the fact that the meaning of the word millat does not, to any extent, affect the issues under consideration, I, leaving aside the controversy altogether, take it that Maulana Husain Ahmad said that "nations are formed by lands". As a matter of fact, I have nothing to say even against this statement of the Maulana. Objection must, however, be raised when it is contended that in modern times nations are formed by lands and the Indian Muslims are advised to accept this view. Such advice brings before our minds the Western modern conception of nationalism, to one aspect of which it is absolutely essential for a Muslim to take exception. It is a pity that my objection has led the Maulana to think that what I had in mind was to propagate the cause of some political party. Far from it, I have been repudiating the concept of nationalism since the time when it was not well-known in India and the Muslim world. At the very start it had become clear to me from the writings of European authors that the imperialistic designs of Europe were in great need of this effective weapon—the propagation of the European conception of nationalism in Muslim countries—to shatter the religious unity of Islam to pieces. And the plan did succeed during the Great War. It has now reached its climax inasmuch as some of the religious leaders in India lend their support to this conception. Strange, indeed, are the vicissitudes of time. Formerly, the half-Westernized educated Muslims were under the spell of Europe: now the curse has descended upon religious leaders. Perhaps modern conceptions of Europe seem attractive to them but alas! if the idols2 to put in it are imported from England!" "Love of one's native country is a part of one's Faith." which they think is a Tradition of the Prophet, but this is hardly necessary. Love of one's native land is a natural instinct and requires no impressions to nourish it. In the present-day political literature, however, the idea of "nation" is not merely geographical: it is rather a principle of human society and as such, it is a political concept. Since Islam also is a law of human society, the word "country", when used as a political concept, comes into conflict with Islam. No one else knows it better than Maulana Husain Ahmad that in its principles of human association, Islam admits of no modus vivendi and is not prepared to compromise with any other law regulating human society. Indeed it declares that every code of law other than that of Islam, is inadequate and unacceptable. This principle raises some political controversies closely connected with India. For instance, cannot the Muslims live in unity with other nations? Cannot the various nations and communities unite for serving the country's ends and so on and so forth? I must, however, perforce, leave these questions aside because at the moment my object is to criticize only the religious aspect of the Maulana's statement. Any other way will be irreligious and contrary to human dignity. The example of Europe is before the world. When the religious unity of Europe got shattered and the nations of that continent became disunited, Europeans began to search for the basis of national life. Obviously, Christianity could not be such a basis. The Europeans found this basis in the idea of nationality. But what has been the end of their choice? The reformation of Luther, the period of unsound rationalism, and separation—indeed war—between the principles of religion and state. Where did these forces drive Europe to? To irreligiousness, religious scepticism and economic conflicts. Does Maulana Husain Ahmad desire that the experiment should be repeated in Asia? The Maulana thinks that in the present-day world land is the necessary basis of a nation. No doubt, this is the general feeling these days, but it is also evident that this basis is by itself inadequate. There are a number of other forces also which are necessary for the formation of a nation. For instance, indifference towards religion, absorption in the day to day political issues, and so on. Besides, there are also other factor which statesmen think out for themselves as means for maintaining unity and harmony in that nation. The Maulana ignores the fact that if such a nation comprises with different religions and communities, the communities generally die away and the only common factor that remains in the individuals of that nation, is irreligiousness. Not even a layman, let alone religious leaders, who thinks that religion is a necessary factor for human life, desires that such a state of affairs should be brought about in India. So far as the Muslims are concerned, it is a pity that, simple-minded as they are, they are not fully aware of the consequences for this view of nationalism. If some Muslims have fallen into the error that Religion and Nationalism can go hand in hand as a political concept, then I want to give a timely warning to the Muslims that this course will ultimately lead to irreligiousness. And if this does happen, Islam will be reduced to an ethical idea with indifference to its social order as an inevitable consequence. But the mischief latent in Maulana Husain Ahmad's statement demands closer examination. I, therefore, hope that readers will peruse the following lines carefully. Maulana Husain Ahmad is a learned divine: he cannot, therefore, be unaware of the dangerous consequences of the view he has set forth for the followers of Muhammad. Whether he has used the word "qawm" or "millat" is immaterial. To use a word for a party which, according to him consists of the followers of Muhammad and to say that land forms the basis of that party, is very regrettable and unfortunate. It appears from his statement that he is conscious of his mistake, but not to the extent which should lead to its admission or rectification. A purely verbal and philological argument is mere quibbling. And a philological distinction between millat and qaum is no consolation. The distinction may perhaps console those who are unaware of the faith of Islam. Surely, this statement cannot deceive those who are in the know of things. The Maulana has not realized that by offering his interpretation he has put before the Muslims two wrong and dangerous views. First, that the Muslims as a nation can be other than what they are as a millat. Secondly, because as a nation they happen to be Indians, they should, leaving aside their faith, lose their identity in the nationality of other Indians or in "Indianism". It is merely quibbling on the words qaum and millat. Otherwise the view is the same that has been described above and which the major community (Hindus) in this country and its leaders are every day persuading the Indian Muslims to adopt, viz., that religion and politics are entirely separate, and if the Muslims want to live in this country, they must understand religion to be a merely private affair, which should be confined to individuals alone. Politically they should not regard themselves as a separate nation; they should rather lose themselves in the majority. By saying that he has not used the word "millat" in his speech, the Maulana seems to pretend that he regards millat as something higher than nation. "There is", he says, "a world of difference between the two, and if the nation be compared to the earth, millat is like heaven." In actual practice, however, he has left no place for millat by preaching to the eight crore Muslims to lose their identity in the country, and therefore in the majority and to make nation a heaven and to ignore the fact that Islam will thereby be reduced to the status of the earth. But why was the Maulana content with the Qamus alone? Has not the word "qaum" been used hundreds of times in the Quran? And has not the word "millat" occurred repeatedly in the Quran? What do qaum and millat mean in the Quranic Verses? Is not the word "ummat" also used in addition to these two words to denote the followers of the Prophet? Are these words so divergent in meaning that because of this difference one single nation can have different aspects, so much so that in matters of religion and law, it should observe the divine code, while from the viewpoint of nationality it should follow a system which may be opposed to the religious system? Had the Maulana sought evidence from the Quran, I am confident, the solution of this problem would have automatically suggested itself to him. The philological meaning of the words given by the Maulana is to a great extent correct. "Qaum" literally means "a group of persons excluding women". Philologically, then, women are not included in qaum. But it is obvious that when the Holy Quran makes mention of the qaum of Musa and the qaum of ‘Ad, women are included in qaum. Millat also means religion and law. But the question is not one of difference between the dictionary meanings of the two words. The real question is this: First, are Muslims collectively a single, united and definite party founded on the Unity of God and the Finality of Prophethood as its basis, or are they a party which owing to the requirements of race, nation and colour can, leaving aside their religious unity, adopt some other social order based upon a different system and law? Secondly, has the Quran ever employed the word "qaum" to denote this idea? Or does it use the words "ummat" or "millat" only? Thirdly, which word does the divine Revelation employ in this connection? Does any Quranic Verse say, "O ye people!" or "O ye faithful! Join the qaum of Muslims or follow it"? Or is the call to follow the millat and to join the ummat? A qaum can have a millat or a particular way of life. The millat of a qaum, on the other hand, has nowhere been used. This means that, in the Quran God has used the word "millat" and not "qaum" for those persons who, after renouncing different qaums and millats embraced the millat of Abraham. What I have said above means that, so far as I have been able to see, no other word except ummat has been used for Muslims in the Holy Quran. If it is otherwise, I would very much like to know it. Qaum means a party of men, and this party can come into being in a thousand places and in a thousand forms upon the basis of tribe, race, colour, language, land and ethical code. Millat, on the contrary, will carve out of the different parties a new and common party. In other words, millat or ummat embraces nations but cannot be merged in them. Our Lord! Accept from us (this humble service of ours). Surely, Thou art the Hearing, the Knowing! Our Lord! After getting the name of ummat-Muslimah from the Court of God, was there any room left for merging part of the form of our society into some Arabian, Iranian, Afghani, English, Egyptian or Indian nationality? There is only one millat confronting the Muslim community, that of the non-Muslims taken collectively. There is another subtle point which the Muslims must ponder over. If the sentiment of nationalism was so important and valuable, why then did some of the people of his own family, race and land rise up against the Holy Prophet (God’s blessings be upon him)? Why did the Prophet not regard Islam as an all-embracing millat and from the viewpoint of nation or nationalism continue to own and encourage Abu Jahl and Abu Lahab? Indeed, why did he not keep the bond of national affinity with them in the political affairs of Arabia? If Islam stood for complete independence, the Quraish of Mecca had the same ideal before them. It is unfortunate that the Maulana does not consider the fact that the Messenger of God was concerned with the freedom of the upright Faith of Islam and the Muslim community. To ignore the Muslims or to make them subservient to some other social order and then to seek some other kind of freedom was simply meaningless. The Prophet had to wage defensive war against Abu Jahl and Abu Lahab because they could not tolerate Islam flourishing in freedom. It was a very easy course for Muhammad to tell Abu Lahab, Abu Jahl, or the unbelievers of Mecca that they could stick to their idol-worship while he himself would hold fast to the worship of God and that they could together form an Arabian unity by virtue of the factors of race and land common to them both. God forbid, but if he had adopted this course, it would certainly had done him credit as a patriot but not as the last Prophet. The ultimate purpose of the prophetic mission of Muhammad (may peace be upon him) is to create a form of society, the constitution of which follows that divine law which the Prophet Muhammad received from God. In other words, the object purify the nations of the world of the abuses which go by the name of time, place, land, nation, race, genealogy, country, etc., although the differences of nations, tribes, colours and languages are at the same time acknowledged. It is thus to bestow upon man that spiritual idea which at every moment of his life remains in constant contact with Eternity. This is where Muhammad stands and this is the ideal of the Muslim community. How many centuries will it take man to reach these heights, none can say, but there is no doubt that in removing the material differences between the nations of the world and in bringing about harmony among them in spite of their differences of nations, tribes, races, colours and languages, Islam has done something in thirteen hundred years what other religions could not do in three thousand years. Take it from me that the religion of Islam is an imperceptible and unfeelable biologico-psychological activity which is capable of influencing the thoughts and actions of mankind without any missionary effort. To invalidate such an activity by the innovations of present-day political thinkers is to do violence to mankind as well as to the universality of that prophetic mission which gave birth to it. That part of Maulana Hussain Ahmad's statement in which he has asked the editor of the Ehsan to produce an authority in support of the view that the millat of Islam is founded upon human dignity and brotherhood, must surprise many Muslims. To me misfortune, or error too, never comes alone. When a Muslim's mind and heart are overpowered by that idea of nationalism which the Maulana is preaching, then it is inevitable that various kinds of doubts should arise in his mind concerning the foundation of Islam. From nationalism thoughts naturally move towards the idea that mankind has been so sharply divided into nations that it is impossible to bring about unity among them. This second error which arises from nationalism, gives birth to the conception of the relativity of religions, i.e., the religion of a land belongs to that land alone and does not suit the temperaments of other nations. This third error must inevitably lead to irreligiousness and scepticism. This is the psychological analysis of that unfortunate Muslim who becomes a victim of spiritual paralysis. So far as the question of authority is concerned, the whole of the Quran is an authoritative verdict for it. There should be no misunderstanding about the words "dignity of man". 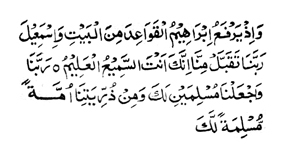 In Islamic thought these words mean that higher reality which has been vested in the heart and conscience of man, i.e., his inner structure derives itself from the immutable divine law, and that his dignity depends for its continuance and preservation upon that yearning for the Unity of God which permeates his whole being. The truth is that in the mind of Maulana Hussain Ahmad and others who think like him, the conception of nationalism in a way has the same place which the rejection of the Finality of the Holy Prophet has in the minds of Qadianis. The upholders of the idea of nationalism, in other words, say that, in view of the present-day needs, it is necessary for the Muslim community to take up a position in addition to what the divine law has prescribed and defined for them for all time to come, in the same way in which the Qadiani view, by inventing a new Prophethood, directs the Qadiani thought into a channel which ultimately leads to the denial of the perfection and consummation of Prophethood in Muhammad. Prima facie nationalism is a political concept, while the Qadiani denial of the Finality of Muhammad is a theological question, but between the two there exists a deep inner relationship which can be clearly demonstrated only when a Muslim historian gifted with acute insight compiles a history of Indian Muslims with particular reference to the religious thought of some of their apparently energetic sects. "The Horse of the Religion of Islam was originally born in Arabia. Now, do not brand him with the Seal of Greece! Similarly, don’t place the Table of Decadence7 in the armpit of a few (Muslim) children, who have just begun their education!" "Country" was the whole world! own traditions, without being affected by Western culture! 3. i.e. than being people of the same country! 5. His real name was "Abdul-Uzza" and was uncle to the Holy Prophet. attachment to a particular country or land! which may bring inferiority complex and decline to their intellectual capabilities.